Our gourmet food hampers feature a range of sweet delights and savoury nibbles so that everyone's preference is included. From Australia's finest chocolatier Ernest Hillier, to the mouth-watering joy of The Woods Farm treats, the pampering of world-renowned skincare from brands like The Aromatherapy Co. each brand is tried and tested for luxury, quality, flavour and pamper appeal. The Best Occasion For Gourmet Hampers? We've Got Something For Everyone. We get asked over and over, what are suitable occasions for sending a gift hamper? Our response is always the same - No matter the occasion, or the recipient, we've got a gift hamper to suit. When we began Australia's premium gourmet hamper company over a decade ago, we began with a simple dream - To bring the most beautiful foods, high-quality gourmet produce, to recipients right across Australia. Back then we did what we knew best, we worked hard to uncover the world's best food producers, and we delivered them across the country - yes, even in old-school gift baskets. Now, we know that the true secret in having the finest Australian hampers is not only in ensuring that we pack our gift boxes full of amazing food and luxury gift items, it's also in ensuring that every hamper looks amazing. Along the way we've researched the best packaging and presentation for our gift hampers, and by providing world-class luxury gift boxes with every hamper, we know that whether you're sending something special for a graduation, birthday, apology, new baby, anniversary... Well, it truly doesn't matter, because each and every hamper looks as luxurious as the products inside. With our custom designed postage packaging, our custom keepsake gift boxes, right through to the custom packaging of products inside the hampers, it's a feast for their eyes, their taste buds and their soul. Want to learn about the gourmet gift hampers available at The Hamper Emporium? Need some recommendations from our extensive gourmet gift hamper collection? Check out the information provided by our team below. What Gourmet Food Hampers Are the Perfect Christmas Hampers? Any of our gourmet food hampers can be used as Christmas hampers. Of course, if you're looking for Christmas themed gifts then certain gourmet hampers are more suitable as Christmas hampers, especially those that contain a celebratory bottle of bubbly. Naturally, each of the Christmas hampers at The Hamper Emporium provide something unique, whether you obtain one of our champagne Christmas hampers or gourmet Christmas hampers. If you're not looking for Christmas products like Christmas pudding or Christmas shortbread, then the great thing about our range here at The Hamper Emporium, is that you could choose many of our popular gourmet food hampers as a Christmas gift. To ensure that your gourmet gift hamper fits the holiday season perfectly, we always suggest choosing one of the gourmet hampers from our Christmas range. Not only can you count on our proven Christmas hampers, you also get many new choices every year! What Are the Most Popular Gourmet Hampers in Brisbane? Okay Australia, it's true! Different cities prefer different hampers, and the numbers show it's true again and again. Depending on the area our customers reside, you will find that certain gourmet hampers are more popular than others. 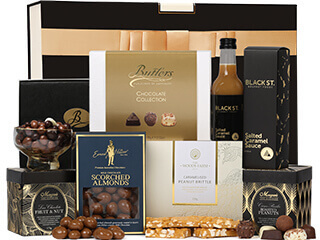 For customers in Brisbane, we've listed our most popular gourmet gift hampers below, which prove extremely popular with residents of the Brisbane area. Our Foodies Hamper is a marvellous collection of high-end gourmet nibbles. 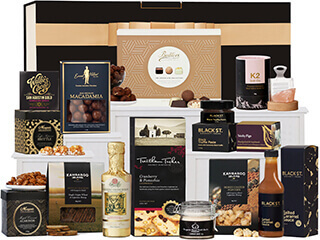 Brands selected for this outstanding hamper include Baylies Epicurean Delights, Kangaroo Island, and the Brewer’s Nut Company, so recipients can count on a variety of treats with variable flavours. No matter the personal preferences of your recipient, the Foodies Hamper provides the versatility you are looking for. With a large collection of items, there is no doubt that your recipient will find something he or she likes. This beautiful pamper hamper is all about nourishing her from the outside in. With beautiful spa quality gifts and the exquisite joy of French skincare brand L'Occitane, this is the ultimate in pamper gifts for women. 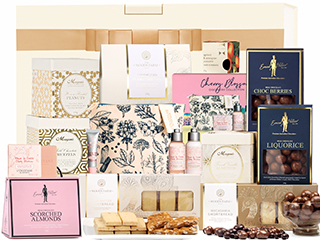 Not only is this sweet hamper pampering, it's also packed full of world-class artisan gourmet treats that will take her on a flavour journey of joy. In the L’Occitane Pamper Hamper, recipients can find unique treats such as honey roasted peanuts, French vanilla almonds, pure butter shortbread and even toffee brittle. These lovely treats are followed by creamy chocolates from Willie’s Cacao, Butlers Irish Chocolates, and Ernest Hillier, so even the chocoholic will love the selection of products inside the L’Occitane Pamper Hamper. Our L’Occitane Pamper Hamper also contains three hand creams from L’Occitane. The hand creams are made with unique Mediterranean ingredients, which ensure various moisturising and nourishing qualities for the skincare products in question. So, women who love to take good care of themselves will love the trio of hand creams inside this amazing Brisbane hamper. Another exquisite hamper suitable for occasions throughout the year is the Sweet Bites Hamper. The Sweet Bites Hamper is full of chocolates, but also chocolate-covered treats. There is also some special toffee brittle, so this hamper has plenty of sweetness to go around. We love delivering sweet hampers to those with a sweet tooth, because we know they're going to be absolutey overjoyed with this beautifully presented gift hamper packed full of the most beautiful of sweet treats. Great for all occasions, this is indulgence at its best. 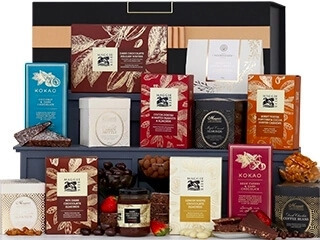 Why Are Australian Gourmet Gift Hampers the Perfect Present for All Occasions? There's a reason we're Australia's best gift hamper brand. We've spent over a decade sourcing the finest of gourmet food, working one on one with suppliers to ensure that we stock only the most delicious, beautifully crafted nibbles, because we feel that our customers and their recipients deserve nothing but the very best. Our gourmet gift hampers are incredibly versatile, meaning they are filled with a variety of gourmet products so there's something for everyone making them suitable for every occasion. Naturally, the large number of products ensures that your recipient is bound to find something he or she likes. Another reason why you should consider one of our Australian gourmet gift hampers is presentation. When you buy a gift online, you often must do some additional gift wrapping afterwards. With one of our gourmet hampers, The Hamper Emporium takes care of the presentation for you. The final reason why you should choose one of our gourmet gift hampers is the premium quality of the products inside. The Hamper Emporium takes excellent care when it comes down to gourmet products, ensuring that customers only get the premium quality they deserve. So, choosing one of our gourmet hampers can certainly lead to a reliable and trustworthy gift choice. Where Can You Buy Small Gourmet Hampers? The Hamper Emporium has a lovely range of gift hampers, which also includes small gourmet hampers to match your budget. Our gourmet hampers are suitable for any special occasion since the diversity of the products inside our gourmet hampers fits almost every recipient throughout the year. Even our smallest gourmet hampers contain top-quality gourmet products, so you do not need a massive budget to find the perfect gift at The Hamper Emporium. What Are the Best Gourmet Hampers in Melbourne? 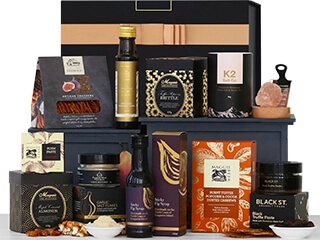 Since The Hamper Emporium delivers their finest gift hampers Australia-wide, you can easily find the best gourmet hampers in Melbourne in our store. We provide high-quality gourmet hampers containing products such as wines, champagnes, and luxurious chocolates. So, if you are buying for the gourmet lover, be sure to check out our range of gift hampers to find the perfect gift for your recipient. Whether you're in Melbourne wanting to send a gift to somewhere else in Australia or you're lookin for the perfect gift hamper Melbourne deliver, then our hampers are guaranteed to impress. What Are the Best Gourmet Hampers in Sydney? Sydney customers can also find the best gourmet hampers at The Hamper Emporium. Our Sydney gourmet hampers also include items such as wine, champagne, chocolates, and sweet nibbles, which are all products that will appeal to Sydney residents. Curious what other things our gourmet hampers can offer you? Be sure to check out the selection of gift baskets and gift hampers at The Hamper Emporium. Do you wish to gift your recipient the gourmet experience of a lifetime? If you do, then our range of exquisite gourmet hampers is the way to go. Inside our range of gourmet hampers, customers can count on classic gourmet-giving experiences, all packed in a beautiful gift hamper. So, whether your recipient has a sweet tooth, enjoys French delicacies or prefers local Australian produce, The Hamper Emporium is the place to be for all your gourmet hamper needs. To ensure our gourmet hamper range surpasses our competitors, our hamper designer searches for the finest gourmet brands in the world; this has led to gourmet hampers containing superior international gourmet brands such as Maison Fossier and Le Cordon Blue. 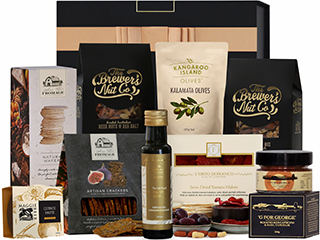 Still, there are many Australian gourmet treats inside our hampers as well because who can say no to gourmet treats from well-known Australian companies such as Baylies Epicurean Delights, Partridges Artisan Bakehouse and Kangaroo Island? To find out more about these gourmet treats inside our range of gourmet hampers. Can I Use a Gourmet Hamper as a Birthday Hamper? Any of the gourmet hampers at The Hamper Emporium can be used as a birthday hamper; this because each hamper contains loads of variety where products are concerned. You can choose a birthday hamper packed with quality wines and champagnes, but also pure gourmet hampers with the finest gourmet treats. Of course, there are more options at The Hamper Emporium if you need a birthday hamper. Check out some of the other sections in our range and discover the birthday hamper that matches your recipient perfectly. How Do You Get Your Gourmet Hamper Delivered? When you shop at The Hamper Emporium, you can get your hamper delivered right on your doorstep. We even offer free standard delivery to every customer, so you are not obligated to pay for the delivery of your premium gift hamper. To get your gift hamper delivered on your doorstep, or your recipient’s doorstep, simply enter the delivery address in the designated field on The Hamper Emporium website. The delivery address will be asked as you check out your shopping cart. Are you having some problems checking out your gift hamper? Get in touch with The Hamper Emporium team for some assistance.